Why is Play Important for Language Development? Play is how little kids learn almost everything! Some late talking toddlers don’t seem to like to play with toys, but “liking” or “not liking” a certain toy isn’t usually what’s going on with a child who doesn’t play. It’s that the child doesn’t know HOW to play. she recognizes operating parts of toys like the knobs, levers, and buttons. She discovers how toys work through trial and error. he understands the construction of toy relationships, like placing a ball in hole, stacking rings, nesting cups, or putting one toy in another, such as a driver in a car. a toddler understands cognitive concepts, including object permanence, cause and effect, and problem solving. 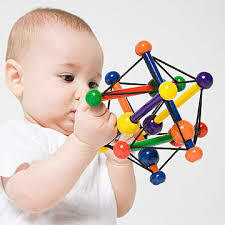 a toddler over age 15 to 18 months primarily mouths or throws toys rather than playing with them. he or she may “stim” with toys—meaning that instead of playing with the toy as it’s intended, he spins the toy, opens and closes doors repetitively, focuses intently on one part, rubs the item between his fingers, or does something other than playing. a toddler doesn’t seem to like toys. she may look at or handle toys, but she doesn’t seem to know what to do next. will likely have difficulty forming social relationships with other children. Sharing experiences during playtime is a ritual of childhood that all kids should enjoy. may struggle with developmental delays in many areas, including their ability to learn new concepts, possibly affecting academic performance once they reach school age. can continue to have difficulty learning language – both receptively (or understanding words) and expressively (what a child can say). This is an excerpt from my book Let’s Talk About Talking… 11 Skills All Toddlers Master Before Words Emerge. Get your copy today!